I recently read your book, Positive Discipline: The First Three Years and I cannot tell you how much better I understand my 2 1/2 year old son! I was hoping you could direct me toward some reading material, or even offer a suggestion though. He is a very bright boy, happy at home. However, he is constantly telling us he is "scared" of other kids, and sometimes adults too. It seems to really hold him back socially. We had a psychologist meet with him, but she stated he is just high strung. I somehow think there is more to it... If you could point me in a new direction? Hi Erin, I can’t tell for sure since I don’t have more information, but I’m going to make some guesses. First let me tell you that this will pass. The less energy you give it, the quicker it will pass. 1. It could be that he really has “decided” to be scared for whatever reason he has made up. Still, to him, the fear is real. The best you can do is comfort him briefly; validate his feelings, “I can see that you are very scared of this;” and then have faith in him to deal with his fear. He will learn that his fear will pass. It is very empowering for children to learn that they can deal with the ups and downs of life. When parents rescue and pamper, children don’t have the opportunity to develop resilience and a sense of their own capability. If you pay too much attention to his fears (give them too much energy) that could lead to the next guess. 2. It could be that he has learned that being scared is a good way to get lots of “undue attention” from you. If this is the case, I would still give the same recommendations as above. You might add problem-solving by asking him for his ideas on how to deal with his fears. For even more ideas I have included an excerpt from Positive Discipline A-Z by Jane Nelsen, Lynn Lott, and H. Stephen Glenn, which also provides an example of how this books provides many possible solutions for just about any behavior challenge you can think of. “A bruised knee can mend, but bruised courage lasts a lifetime.”1 Sometimes children have fears because we don’t help them deal with the unknown by showing them how to do things in small steps. Most children have some fears, but they become bigger when others make fun of them, call them babies, or tell them that it’s not okay to be scared or to cry, or label them as “overly-sensitive.” Fears also get bigger when parents feel sorry for children and try to over-protect them. Then children don’t develop the confidence that they can handle some discomfort. Fear is usually about the unknown (which is why a fear of the dark is common and usually passes). However, at other times children have good reason (such as bullies or sexual abuse) to be afraid. It’s your job to know when to protect your children and when to help them without over- protecting them. Don’t laugh at, minimize, judge, or discount your children’s fears. Contrarily, don’t over-indulge or over-protect or try to explain away your child’s fears. Listen when your children tell you what they are afraid of. Verify their feelings, such as saying, “You’re afraid of dogs because they might bite you, and you wish the dog would go away and leave you alone.” Sometimes, just having their feelings validated is enough to lessen the fear. Help your children find ways to handle situations when they are afraid. Help them explore several possibilities so they feel they have some choices. You might ask, “What would help you the most right now--a flashlight, a teddy bear, or a nightlight?” Telling them not to be afraid isn’t helpful; looking for solutions is. Encourage your children to deal with difficult situations in small steps. If they are afraid of the dark, put a night light in their room. If they don’t think they can sleep in their own rooms, fill their hands with your kisses and tell them every time they miss you to open their hands and take out a kiss. If they think there are monsters in the closet or under the bed, do a search with them before bedtime and let them sleep with a flashlight. Listen carefully. Are your children trying to tell you that someone is hurting them or that you are doing something that is frightening them? Take what they say seriously. Sometimes children’s fears are irrational and they can’t explain them. They may need your support and reassurance until the fear goes away. There are many wonderful children’s books dealing with fears that you can read with your children so they can see they aren’t alone. Don’t lay your fears on your children. If your children decide they are ready to try something, work with them in small steps to make it safe and then let go instead of stopping them from doing things you are afraid of yourself. If you’re too afraid, arrange for a friend or relative to do the activity with your child. It’s okay to share your fears, but don’t expect your children to have the same ones you do. Telling your children about a fear that you conquered may be comforting to them. It will assure them that fears are normal. Ask your children if they would be willing to try out scary things two to three times before deciding against them. Don’t push your children into doing things they are afraid of such as swimming or riding a horse. Some parents insist that their children do these things in spite of their fears and create lifetime fears in their children, as well as a strong feeling of inadequacy. Turn off the TV and stop immersing your kids in the news which is filled with violence and natural disasters. Too much TV has been the trigger for many children’s fears, and rightly so. Children can learn that it’s okay to feel fear, but they don’t have to be immobilized by it. There is someone who will take them seriously and help them deal with their fears so they aren’t so overwhelming. They learn they can trust their parents to protect them from dangers they can’t handle by themselves. If your children are afraid to leave your side, spend time with them, but also create situations where they can be away from you for short times. Many a preschool teacher has had to pull clinging, screaming children off their parents’ legs. Minutes later, with the parents gone, the children have settled in and are happily playing with the other children. Don’t force your children into situations that are overwhelming to them just so they will be brave. Some children learn by jumping into the pool, and others watch from the sidelines for a summer before they put their faces in the water. Respect their differences and have faith. Ten-year-old Lisa decided she wanted to watch Halloween III, an extremely scary movie. Her parents said they thought the movie was too scary, but she insisted on watching it. No one in her family wanted to watch the movie with her, so Lisa decided she would watch it by herself. Her parents said they would be in the next room, and if she got scared, she could come in for reassurance. Lisa’s mother made her a bowl of popcorn, and her father helped her carry in her stuffed animals and special quilt. He turned on all the lights at Lisa’s request and left the room as the movie began. Some children do what they really don’t want to do so they can win the power struggle with their parents. Lisa’s parents supported her to learn for herself how much she could handle. This contains all the information on the 12 CD set in a single CD package. And we pass the saving onto you. The perfect gift to go with that new ipod or MP3 Player. It is so rewarding to hear that Positive Discipline is making a difference all over the world. Recently I received the following email. My name is Marisol Zeron and I am head of the orientation department at Escuela Bilingue Bambinos in Honduras. As you know we are a Third World Country with lots of limitations. Our school has become addicted to your Positive Discipline curricula it's just amazing!!! We really want to make a difference among the children in Honduras and we were wondering if there was possibility that we could fly you out here to give a seminar to a whole community of schools? The goal is to get people hooked on Positive Discipline to understand it and love it the way we do! We are looking forward to sending Certified Positive Discipline Associates to Honduras. This weekend I facilitated a two-day workshop on Teaching Parenting the Positive Discipline Way and we now have 30 more Certified Positive Discipline Parent Educators. It is such a joyful and gratifying experience to be with the people who are attracted to this work. They are so positive and passionate and really believe we can create peace in the world through creating more respectful relationships in homes and schools. I have scheduled another two-day workshop for March 7-8, 2009. Please go to www.positivediscipline.com for more information. The last workshop filled up three weeks in advance, so register early. 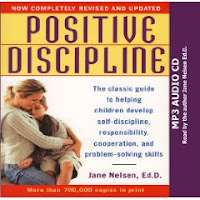 To find two-day workshops on Teaching Parenting the Positive Discipline Way and Positive Discipline in the Classroom in other locations and dates, please go to www.posdis.org If you haven’t already listened to podcast No. 49 where I interview Marianne McGinnis on “Workshop Results,” you will find it delightful and inspiring. Two-day workshop for parent educator training and/or in depth training for parents--filled with experiential activities. Two-day workshop for parent educator training and/or indepth training for parents--filled with experiential activities. Olivia, in my opinion you would be more effective and teach your child many valuable life skills by admitting you unknowingly made a mistake. Then let him know you would like to work WITH him to find a solution. Then ask him if he knows what his mistakes were, what he learned from them, and what ideas he has to solve the problems that would work better than punishment. I'm sure you can see how much more he will learn from this. Before you start, remember the new Positive Discipline theme: Connection before Correction. Let him know how much to love him before you start this conversation.